A hypothetical image of what it would look like if Africa had split into two parts along the West African rift system forming a 'Saharan Atlantic ocean'. When dinosaurs still roamed the Earth, land could have torn apart to create a Saharan ocean in the middle of Africa, University of Sydney research explains. 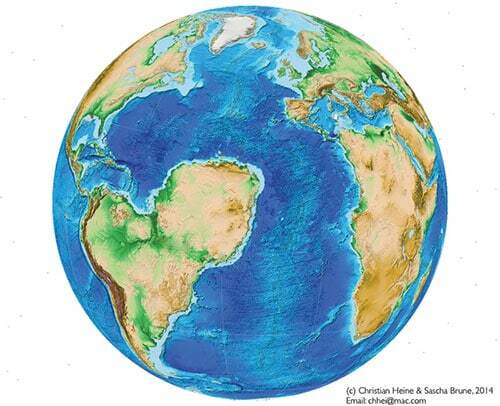 Between 150 and 100 million years ago the southern continents were still united in the supercontinent Gondwana but rift systems, indicative of the imminent breakup of continents, extended between present-day South America and Africa, as well as within Africa. A rift system occurs where, under enormous tension, the earth's crust splits or tears. A continent breaks apart depending on how much it moves along the rift, where the crust pulls apart. The researchers describe the interaction of the two factors which determine this: the orientation or direction of the rift; and the angle at which force is being exerted, or the 'pull' on it. Using plate tectonic and 3D numerical modelling researchers Dr Christian Heine and Dr Sascha Brune, from the University's School of Geosciences, investigated how these rift systems evolved over geological time and why Africa did not split. Their findings have been published in the latest issue of Geology. "Over 130 million years ago rift systems were about to split the African-South American part of Gondwana into nearly equal halves to create a south Atlantic and a Saharan Atlantic ocean," said lead author Dr Christian Heine. Now employed in the private sector, Dr Heine undertook research into this paper while based at the School of Geosciences. The tear would have occurred along the south Atlantic and west African rift systems, extending along the present-day margin of South America up to Nigeria, and from there further north towards Libya. Researcher Dr Sascha Brune said, "In a dramatic 'plate tectonic twist', instead of the tear splitting northern Africa, it happened along the present-day South American and African Equatorial Atlantic margins (between Nigeria and Guinea) and movement along the west African rift ceased. "German scientist Alfred Wegener first proposed the idea of continental drift in 1912. This study is a milestone in our understanding of how the Earth's continents came to be sculpted into the shapes we recognise today." "As you might expect the more in line the force or 'pull' is with the direction of a rift the greater the movement," he said "Where the pull is perpendicular to the rift there is most resistance and least movement." The west African rift stopped moving around 110 million years ago because of these dynamics. The modelling explains that this event caused the acceleration in the movement of the South American plate (from about 0.3 cm/year to nearly 4 cm/year), starting 120 million years ago. The research helps outline the history and dynamics of many of the failed rift systems preserved in the subsurface of continents, which often also host significant hydrocarbon resources.